I suppose these days you might say that Kale is trending. Kale is a great food to incorporate into your diet because it is low-calorie but jam-packed with vitamins A, C and K as well as iron and potassium. It’s shown evidence as an anti-cancer food and may also help fend off diabetes, high blood pressure and heart disease (info from Medical News Today). My husband and I had gotten pretty hooked on it back in Georgia, but I initially had trouble finding it in our small town once we moved to Mississippi. People in Mississippi tend to eat their green leafy foods collard greens style (also a great food). However, I was so excited to recently spy a big bag of chopped kale leaves at our local Corner Market! We haven’t eaten it as much since the garden froze over, so now that I know I can buy it locally, I am ready to get back into the habit. The first response is often because they have nibbled a piece of raw kale in the past (Fun fact: Pizza Hut is one of the top buyers of kale. They use it to decorate their buffets and salad bars). Even as someone who cooks a lot with kale, I have to admit that I wouldn’t want to dig into the decorations at Pizza Hut, myself. Raw, unseasoned kale just doesn’t taste too appetizing to me. 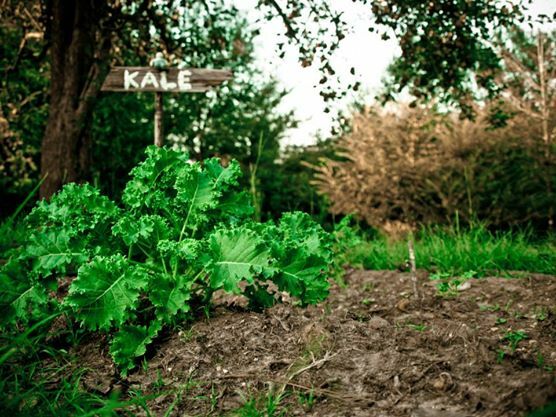 My grandpa didn’t understand why in the world Dane would plant kale in in our garden, and he kept on about how we had killed and buried a man by that name there (maybe because that was more understandable to him than us actually wanting to eat the stuff). The answer is, a lot of things. Kale is super fun to experiment with! Just as long as you make SURE it is fresh and not wilted at ALL. There is nothing worse than the smell of past-date sauteed kale (I speak from experience). That being said, here are three very simple ways to incorporate kale into your weekly dinner plans. This one is a staple in our house, and it pretty much doesn’t get any more simple than this. -Kale ( I like to buy the leafs pre-chopped in a big bag if available or if you buy the leaves then shred it by hand, discarding the stalk). First heat about 2 tablespoons of the oil (sometimes more, depending on how much you want to make) in a large skillet on medium heat. Keep in mind that the kale will shrink a lot when you cook it, so it’s okay to start out with more kale than you think you’ll eat. Add the garlic and stir with a wooden spoon until it is soft but not burned (1 minute or so). Add kale by the handful, flipping it over and around the pan to make sure as many leaves as possible get some of the oil on them. The main thing to remember here is that you DON’T want to overcook it. Kale should be softer when cooked, but still a deep, rich green with some firmness to it. To accomplish this, make sure that every handful of new kale you add is on the bottom, while the previously cooked kale gets flipped over on top (to keep it warm but stop it from cooking). The whole cooking process should really only take a few minutes altogether, depending on how much you make. Once your kale looks shiny, hot, green and delicious, throw it on a plate or in a bowl and toss it with some sea salt and fresh ground black pepper (maybe even a little Parmesan!). There you go…Easy peasy! I can’t take credit for this one, as it comes from Gwyneth Paltrow’s clean-eating cookbook, It’s All Good. However, I will vouch for it as being healthy, simple and definitely comforting on your tummy! I’m going to use some of Gwyneth’s instructions and modify with some of my own. Part 1: Quinoa: This takes the longest, so you’ll want to get it going first. Rinse 1 cup of quinoa thoroughly and place it in a pot set over high heat in 1 and 3/4 cups of water and a pinch of salt. Bring the quinoa to a boil, lower the heat, cover the pot, and cook until all the liquid is absorbed and the quinoa looks fluffier, usually about 20ish minutes. (Sometimes you may want to taste it and if it is still a bit “crunchy” then add some water and cook on low a little longer). Fluff with fork when finished and put on warm. Part 2: Kale. For this recipe, we typically just sautee it exactly as in the first recipe. Easy, right? Make enough kale for however many people you are serving, but the amount of Quinoa you just cooked typically serves 4. Part 3. Egg: Put a thin layer of olive oil (not butter) in your frying pan and then fry each of your eggs as per usual. Grind just a bit of sea salt into each egg before it is completely cooked. Personally, I like my yolk a little runny so I can pop it later. Yummy. Some people (like my husband) think that’s gross. But it’s your food, so your call. Part 4: put it altogether. 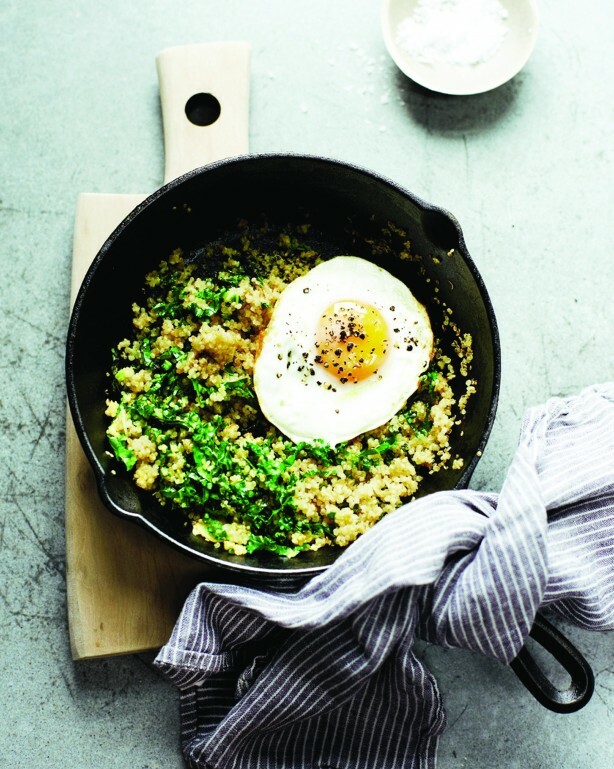 Throw your cooked quinoa into the pan with your kale and make sure it’s all warm and mixed together (the quinoa should still be hot, and you can put your burner on warm if you need to). Divide into bowls and each with a fried egg, a bit of thinly sliced scallion, some sea salt and some black pepper (also, I LOVE a little Sriracha hotsauce on there)….SO GOOD. First boil, cool, and peel some eggs (one egg per person). Next, cook 3-4 slices of bacon in a large pan. Heat until they are cooked, but not crispy. Remove bacon, and drain most of the oil out of pan, leaving about 1-2 tablespoons in pan. Return pan to heat and cook 1/2 diced onion until translucent in the bacon grease. Now add your kale, and basically you are going to use the same technique as with the saute recipe again. You’re a pro at this by now, just don’t over cook! Now chop up the bacon you removed and add it back in for a minute. 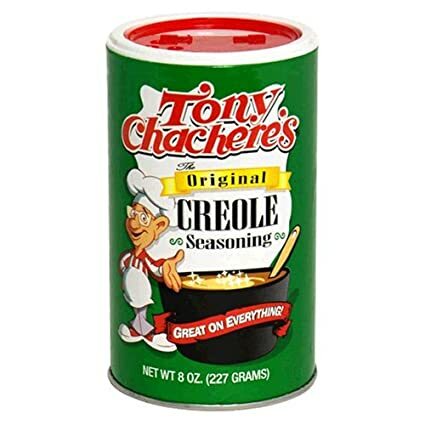 Sprinkle with some “Tony’s” and black pepper and toss. Divide into bowls and top with slices of boiled egg. If you want a little extra bacon on top then that’s not bad either… You can serve with Quinoa or dirty rice (or red beans and rice!). Top with Louisiana Hot Sauce if you like it spicy! I hope you enjoy these simple methods for cooking this amazing, nutrient-dense food! I didn’t even get to explaining home-made kale chips, but maybe another time! As you probably noticed, once you have the basic sauté recipe down there are many variations with which to experiment. Do you have any favorite ways to cook kale?